During the time that you are wearing braces it is very important to be careful about what you are eating as well as more diligent in keeping your teeth and orthodontic appliances very clean. 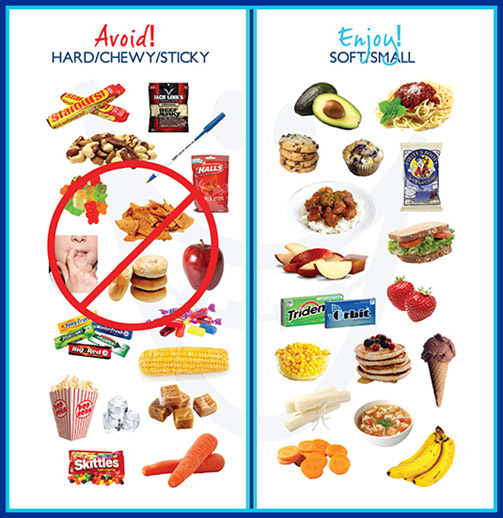 Eating certain foods (especially hard, sticky, crunchy, or tough foods) and certain oral habits (like chewing ice, biting pens, or nail biting) can be very damaging to braces. Risky oral behaviors can lead to frequent breakage of orthodontic appliances, which may significantly prolong your treatment time and compromise your treatment outcome. Although, there may be some foods to avoid during treatment, there are still many delicious and satisfying things that you can eat. It is important to remember the key to good health is maintaining a nutritious and well-balanced diet.